A brighter smile could be yours today. Imagine! You’d look younger and more attractive immediately. Centre Dentaire Tesolin offers several methods of teeth whitening at his Montreal office. After consulting with you, he’ll be able to recommend the right type for your situation. Across the globe, people are raving about safe and effective dentist-administered Zoom! Whitening. In about an hour, Zoom! can lighten tooth enamel six, eight, up to ten shades. Stains from wine, tea, coffee, tobacco, tetracycline medications, and age vanish with powerful Zoom! Whitening. The light-activated bleaching power is potent and fast. It’s also safe! 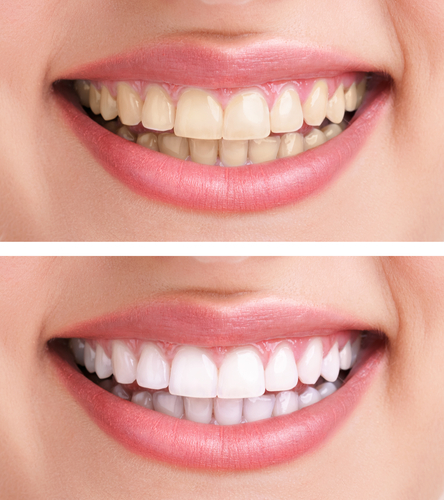 If you prefer a more gradual change, ask us about professional-grade home whitening kits. While over-the-counter systems work well for people with mild tooth discoloration, our potent teeth-whitening kits require a dentist’s prescription. We’ll make custom mouth trays to hold the bleaching gel against your teeth for amazing results. After about two weeks of using the gel filled teeth-whitening trays as directed, your teeth will have the same sparkle that in-office teeth whitening provides. When tooth enamels begins to tarnish, simply reuse the custom mouth trays and order additional teeth-whitening gel from our office. You can keep your smile bright forever! We have served Montreal area patients with excellence for nearly two decades, and we want to give you a reason to smile. Call today to discuss Zoom Whitening, Deep Bleaching, or home teeth whitening with one of our dentists or one of our hygienists.